Buying men Valentines Day gifts can be rough. Are flowers too feminine? Is jewelry even a thing? But don’t sweat it — we’ve found the best gifts he won’t expect (but will love) and have gathered them all here for you. If you’ve ever wondered if it was weird to send a man flowers, The Manly Man Company’s got you covered with their bouquets made entirely out of edible beef jerky. They’re available in three flavors (original, teriyaki and spicy) and come in either a beer mug or glass pint. With a simple saliva test, Ancestry can determine his ethnicity, explain how DNA impacts characteristics like taste aversions or a freckly face, provide information about areas his ancestors lived, and connect him to his closest living relatives. You can’t find a more impactful gift than that. This hot bag is the perfect replacement for whatever falling apart duffel your man continues to use. 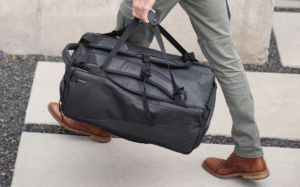 It has ample space for trips (it’s international carry-on standard) but is versatile enough to be used as a gym bag. Plus the innovative strap system allows him to switch between backpack and duffel without missing a beat and it’s got pockets for days. 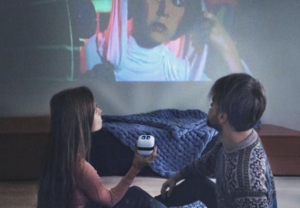 The Cinemood projector lets you project movies in the car, on the wall of a tent or the ceiling over your bed with this 3-inch portable projector. 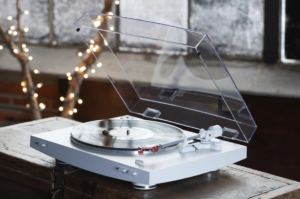 It’s easy to use, has a large storage capacity and an up to 5-hour rechargeable battery life and can create up to a 12-foot projection on any flat surface. Think of all the fun dates and adventures you can take this little guy on. Mmm chicken nuggets. 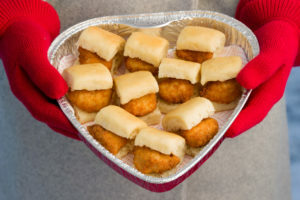 Send him a platter of chick-fil-a nuggets or chick-n-minis in a heart-shaped container. The heart shape shows you love him. The nuggets show you really love him. 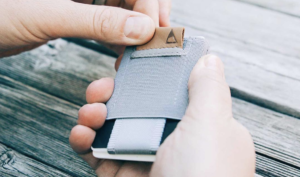 A wallet is a classic gift so why not upgrade him to this minimalist wallet that holds everything he needs — and nothing he doesn’t. For organization, this slim wallet is the way to go. It’s sleek and has an pull tab that pops out his top four most-used cards. 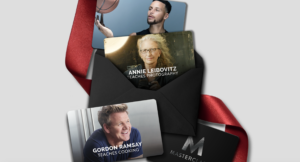 Why not give him the opportunity to learn from true masters of their craft — from Steph Curry to Steve Martin? Since knowledge is forever, this is truly the gift that lasts a lifetime. Don’t act like this isn’t a super attractive cell phone case. 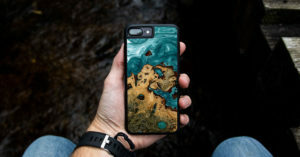 Upgrade your man’s phone with Carved. Not only will he look cool, but he’ll carry your gift with him everywhere he goes. If he likes to get creative in the kitchen (or you just want to tell him you think he’s hot), this homemade hot sauce kit is the way to go. It’s got all the tools and ingredients for him to make two uniquely flavorful hot sauces himself. You know he looks good all dressed up in a classy shirt and tie, so update his rarely-used formal wear or give him something new for his daily office outfit with a swanky DAZI tie. How cool is this vintage camera? It’s got a secondary portrait lens, remote control trigger, and uses Bluetooth to connect to the app unlocking several creative tools. Dollar Shave Club’s goal is to help men look, feel, and smell their best. Send him a gift set or get him a gift card so he can receive the subscription box in the mail time after time. (AKA it’s the gift that keeps on giving).